What does it mean to do a World Cup prediction with feng shui? “I am surprised so far no one is using any Chinese metaphysics in the chart rooms to predict the winner of the world cup, may be we have come to the realization that we cannot really predict the future with any precision, especially something as unpredictable as a football game, but lets have some fun just the same. If we look at the yearly star chart for 2014 and locate the three countries using Brazil’s capital as the Taiji, with the yearly number 4 Green Wood in the central palace, then Argentina is located to the SW with 1 White Water generating into Brazil in the middle and Germany is located to the NE with 7 Red Metal controlling the host Brazil. 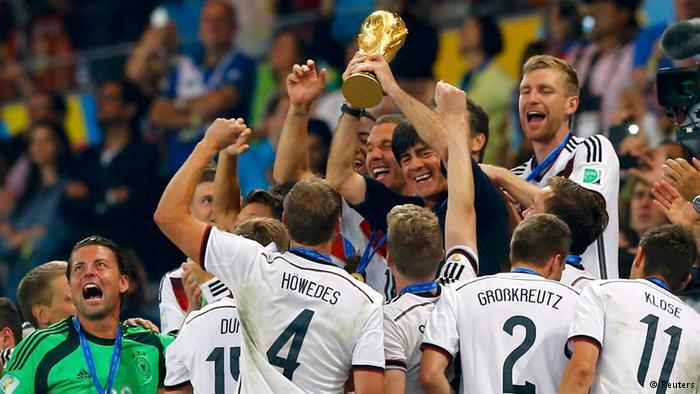 My prediction, using the yearly star calculations, that Germany is going to win the World Cup in 2014, is not really a prediction in the sense that I can tell the future with feng shui. It is a result of looking at the potentials and tendencies of a situation using both the rational and the correlative mode of thinking preferred by the West and the East respectively. The rational part is done through observation and analysis and the correlative part is done through using Flying Star to give me the feeling that that what I have in mind rationally is in tune with the Heavenly cycles of luck in space and time (or some would say “in tune with the universe”). In other words, as far as I am concerned, it will be a reasonable and a “lucky” guess! The “trick” I used here is to base my starting point of my prediction with the betting odds, because research has showed that betting odds have up to 70% rate of success in forecasting a winner, and my chance of success is higher if I can reduce the odds to three teams, instead of a larger number of favourites. I also did a lot of research before hand about the chances of Germany winning the cup, especially the cultural differences between the German and the two South American teams, because Human Qi is always at the bottom of the an outcome when dealing with a feng shui analysis. The Germen would play as a team; whereas the South Americans tended to promote the idea that one star player can make the difference. So my successful and so-called “prediction” with feng shui is a result of using an intelligent guess utilizing both the logical and the intuitive part of my brain (my “heart-mind” as the Chinese would say), but it is not “scientific” in the sense that the correct result can not be repeated every time. It is really an applied art form, integrating the rational with the irrational, or the intellectual with the emotional, part of me to come out with a suggestion, that can imitate the Chinese ideal of “tian ren he yi” 天人合一, that Man and his Universe can become One. When Heaven and I are One, may be, just may be, I can see into the future and in this case I was lucky and I was in tune with the universe, but please don’t expect me to repeat it again for the next world cup! Q. Do you know or have heard of any theory that says: Stars fly according occupations: Potency and support the Star 2 so that the doctor has more patients and potency and support the Star 7 for dentist to have more patients, etc. 1) It is a translation misunderstanding. The general rule for Flying Star is 山管人丁水管財 or “The Mountain (Star) “guan” the number of people in a family (i.e health and off-springs) and the Water (Star) “guan” the wealth. The character “guan” can mean to manage, to discipline or to bother with. This theory interpreted the character to mean to manage in the sense to control, but in fact the term “guan’ here has the real meaning to correlate, that is the Mountain Star is correlated to Health and the Water Star is correlated to wealth and not with the sense to overcome or to control bad health or wealth. 2) It is question of logic. If a doctor is to take care of sickness, his clinic should be a healthy place and not a place to attract sickness. The Mountain Star 2 and 7 are correlated to sickness and mouth/tooth problems respectively when they are out of time, it means that there is that potential and tendency but they do not attract sick people to a medical and a dental clinic. 3) The third trouble I have with this theory is the timeliness of the stars and their relationship to each other are not taken into consideration. 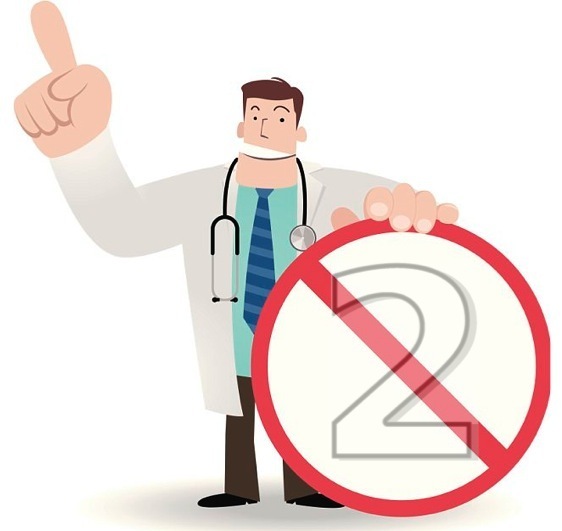 When 2 or 7 is timely they can be good, they need not be correlated to sickness and sore tooth only. Also, if ever 2 and 7 are together they do not need to mean sickness of the Mouth/tooth only, they could also mean that there is potential for fire and/or for passion because 2,7 come together is Early Heaven Fire. 3 Case Studies from the Old Masters. We had a very special work sample during our last master-course workshop in Zurich on feng shui and residential dwellings, where the use of the hetu numbers, the influence of the yearly stars and the how to handle 2 parts of a house built many years apart, have to be addressed. As apart of the feng shui theories in teaching, I translated the following 3 case studies from Master Shen Zhu-Reng and his son, to show how these issues were tackled in the past. 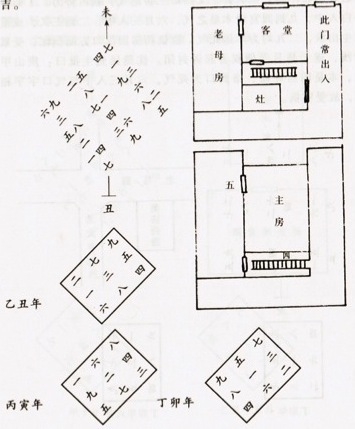 The Shen’s residence in Wixi has a 2-skywells and 3 –rows building configuration. It sits on N2 and faces S2 and was built in Period 3. In the past few years there were many mishaps, like the loss of wealth and loose gossips affecting the 3 women of the household (a grandmother of 81, a mother of 45 and a young woman of 27), who all have the Minggua of 6 White Metal, that is because the house controls the Ming of these 3 women and you can see it in the chart of the house. At the facing palace, the Luoshu number is 9 and Period number is 7, 9 and 7 represented Latter and Early Heaven Fire. At the front door, the Luoshu number is 2 and the Period number is 9, again they represent the Early and Later Heaven Fire. The access door from the outside to the Kitchen is located at Xun, with a Luoshu number 4, a Period number 2 and a Sitting number 7, which mean Wood is feeding an Early Heaven Fire combination. So all the 3 palaces at the front all have Fire to melt the 6 Metal Ming of the 3 women. Normally the Luoshu plate and the Period plate have less “immediacy and influence than the sitting and facing number, but in this case, there is a lot of synchronicity of the numbers to make the retro-divination sensible. The house sits on NE1 and faces SW1, it was built in the beginning of Period 4 (1924-1943). The first few years were very good for the owner, as can be seen from the yearly star for 1925 (Yi Chou), 1926 (Bing Yin) and 1927 (Ding Mao). It is an interesting case because it has the untimely 7 Metal at the facing yet the yearly star entering from outside seems to have neutralized the situation. The owner holds a very important position in a gold-trading business, it is risky yet managed to do well, will it continue to do so? Master Shen commented that this house has a complete Sanban Gua (A “reversed house wirh Parent Sanban Gua), so it is an auspicious place to live. 1925: Facing has control-in, door has control-out; so it should be an average year. 1926: Facing has generate-in, door is of-the-same; so it should be a good year. 1927: Facing has of-the-same, door has of-the-same as well; so it should be a good year as well. The Sun residence has a older part at the front which was built in Period 5 and a newer part built in Period 3 (1919), it sits on Zi (N2) and faces Wu (S2), jian Gui (N3) and Ding (S3), which means a replacement for each is required. The owner did well until after Period 3 while things begin to decline, it is because the back door of the front house begin to take in the declining qi of the back at the front in Period 4. The situation became even worse in Ding Mao year (1927 – when1 flies into the middle palace) when the 5 Yellow arrive at the front of the house. Also in 1931 when the 5 Yellow arrive at the front door. “Flying Star” Feng Shui is also known as Xuan Kong Fei Xing or the ‘Mysterious Void’ Flying Star Feng Shui. The character “Xuan” refers to time, “Kong” refers to space and “Fei Xing” refers to cycle changes in space and time. That is, the principle of Xuan Kong lies with the interaction of Yin and Yang forces and the Five Agents of Nature (Wu Xing). He also mentioned that the secrets of Xuan Kong rested in the “Ai-Xing-Shu” (the method of knowing how the stars take off (in a chart)). However, Yang never divulged how this was done. The art was passed onto Wu Jing-Luan (? – 1068) during the Song Dynasty (960 – 1279), Wu Jing-Luan was also known as Wu Zhong-Xiang, he came from Dexing country (now Jiangxi province). His grandfather Wu Fa-Wang was also an expert in astrology and Feng Shui. He sent Jing-Luan’s father to study with the famous Chen Tuan in Huashan. Subsequently, Jing-Luan learned his art from his grandfather and father and became well known. In 1041, the Imperial Court invited him to become its Yin-Yang expert giving advice to the Emperor himself. When he was asked to make comments about the imperial burial ground he was too frank, and said that the place has Kun Wind (Yin Qi) that will affect the Emperor and his mother’s future. Song Emperor Ren-Zhong was not pleased and locked him up in jail. He was not released until Ren-Zhong died and his son Hui-Zhong pardoned him. Xinyin” (Principles of Qi from the Heart) and “Master Wu’s explanation of the Yi”. The art was later passed onto Jiang Da-Hong during the end of the Ming Dynasty (1368 – 1644). In keeping with the tradition of “thou shall not divulge the secrets of Heaven” none of these masters from Jin to Qing Dynasties (almost 1500 years) explained how the ‘stars’ would ‘fly’ in their books written for the public. The secret of the orbit of the Nine Stars was passed down solely by discipleship or within the family through word of mouth. Because of the secrecy surrounding the transmission of the art, Flying Stars Feng Shui began to die out until the middle of the Qing Dynasty (1644 – 1911), when there was a revival of interest in the Song culture, including Xuan-Kong Feng Shui. Shen Zhu-Nai of the late Qing Dynasty, who made a great effort to study, Jiang Da-Hong’s work without much success, decided to seek out the secrets of the Flying Stars. In 1873, he went with a disciple/friend Wu Bo-On to the town of Wu-Xi in Jiangsu to seek out the children of a Feng Shui master called Zhang Zhong-Shan who had learned the secrets of the “Ai-xing-shu” from Jiang Da-Hong. They stayed in Wu-Xi for several months without learning anything. In the end they had to pay a large sum of money just to have a look at the manuscript written by Zhang Zhong-Shan and kept in the family as a treasure by his offspring. The manuscript was called “Yin-Yang-Liang-Zhai-Lu-Yan” (Record of Experience of Yin and Yang Dwellings) which was file notes of Zhang’s consultations. They secretly copied the whole manuscript by hand in 24 hours and took it home with them to study in detail. After many years, Shen still could not decipher the secret, until one day he realized by chance when he was comparing the Luoshu and Yi Jing that the stars don’t stand still, but they ‘fly’ through in fixed orbits according to a time cycle and the orientation of the house. He compared his findings with Zhang’s manuscript and found his theory matched with Zhang’s practice notes. With this realization in mind he restudied all the writings of Xuan Kong masters in the past and made sense of their coded messages once and for all. When Shen Zhu-Nai was alive he had many disciples. He started to write up his lifetimes’ work in a book called “Shen Shi Xuan Kong” (Shen’s Study of the Mysterious Void) but died before he could finish it. It was completed by his son Shen Zhao-Min and disciple/ friend Jiang Yu-sheng and published under his name in 1927. 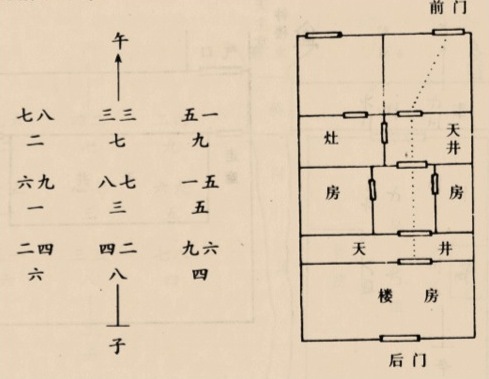 The book included explanation of how to set out the Flying Stars patterns and the practice notes of Zhang Zhong-Shan. A few years later, in 1933 his sons and disciples further re-edited and enlarged the book from four chapters to six chapters with additional writings by friends, disciples and experts of the past. It was re-issued as “The Expanded Shen Shi Xuan Kong Xue”. As one can see from the brief history, although Xuan Kong Feng Shui has been around since the Jin Dynasty, its secrets were not revealed until recent times. Shen’s book greatly influenced the practice of feng shui in modern day China, Hong Kong and South East Asia. A new generation of Masters like Bai He-Ming of Hong Kong and Wang Wen-Huo of Talwan have published annotated editions of Shen’s books. Further making them accessible to the modern day Feng Shui practitioner. Together Bazhai Pai, Xuan Kong Fei Xing and Xing Shi Pai are the three most popular Feng Shui schools in practice today. The path of flying star was kept a secret for nearly 1,500 years. I saw your recent article in Feng Shui Today. Sorry Howard, but I cannot agree with you. 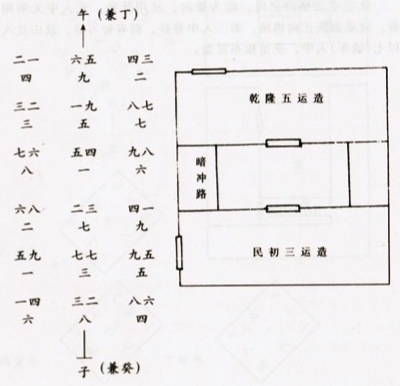 The comment by Guo-Pu was pure San He landform feng shui, where he points out that the source of the Sheng Qi can be derived from the examining the open Ming Tang in front of a site. Nothing to do with Xuan Kong. Xuan Kong only came a lot later, probably no earlier than the Yuan dynasty, despite Yang Yun Sung’s use of the same words. Good to hear from you and you have raised an interesting point. Because it is not an academic paper, I have not given this source a reference, but the theory came from p169 of Hu Jing-Guo’s book “Xuan Kong Feng Shui Xue”. Master Hu quoted a source from Tang Dynasty which referred to Guo -Pu and Guo said to the effect that the “red bird” (what is in front of a site) can give birth to timely qi (wang qi and that is similar to what you said, “that the source of the Sheng Qi can be derived from the examining the open Ming Tang in front of a site”). To Hu that is an indication that Guo-Pu already knew something about Xuan Kong. On the other hand we don’t know if Gua-Pu actually knew about San He either because he (if Guo was actually the author) wrote mostly about the form of the land, Yin and Yang and Wuxing qi. It is really difficult to date any theory in feng shui because what we can read in books are not neccessary the hidden or lost oral transmission going on behind the scenes in practice, we can only make conjunctures about them and quote written sources with our own interpretations. BTW, can you quote the written source when you said “Xuan Kong only came a lot later, probably no earlier than the Yuan dynasty”? Because that is also an interesting alternative theory. The other problem is the term Xuan Kong because it is not referring to any particular feng shui methodlogy, so we have Xuan Kong Fei Xing, Xuan Kong Da Gua and Xuan Kong Liu Fa and so forth and they all came from different times. It is abit like San Yuan, San He and Jiu Xing, there are many Liqi techniques using them as covering terms. It will be good to hear a feedback from you. Recently someone is spreading unfounded information that Xuan Kong Fei Xing 玄空飛星 is a school that started around 1930. His intention is to say that this relatively new school of Feng Shui does not work as what people expect and that his practices are much more powerful. This is very poor marketing exposing his ignorance. Probably this person cannot understand Chinese books written longer than 100 years ago. The principles of Xuan Kong began with the Qing Nang Jing 青囊經 given to Zhang Liang 張良 by Huang Shi Gong 黄石公 during the reign of Qin Shi Huang 秦始皇 (259 BC – 210 BC). The technique of the flying stars is well explained in the classics Xuan Kong Mi Zhi 玄空秘旨，Xuan Ji Fu 玄機赋, Fei Xing Fu 飛星赋 all published in the Song Dynasty 宋朝 (960-1279). In Western Feng Shui, the term “Feng Shui Cure” is often used; it gives us an impression that a Feng Shui consultant is like a house doctor, he or she can prescribe medicines to cure a sick house, this is unlikely because a sick house can only be correlated to a sick person as a metaphor; physically speaking, a house is not the same as a person and cannot be “cured” with “medicines” or objects. So far I have not manage to find out where this term “Feng Shui Cure” originated from or who is the first to use this term in English literature on Feng Shui, my suspicion is that it refers to the popular use of objects to “Hua Sha” 化煞 as in the use of the Five Emperors coins to “Hua Sha” the yearly Tai Sui (Grand Duke) or the Five Yellow in Flying Star. But to translate “Hua Sha” as “Feng Shui Cures” is misleading, it changes the whole meaning of the original Chinese term. “Hua Sha” is a part of the Feng Shui saying, “Jei Xiong Hua Sha” 解凶化煞 which literally means to become aware and to understand (Jie 解) what is harmful or undersirable (Xiong 凶) and then find a way to transform or to change (Hua 化) what is, or what is felt to be, negative and undesirable (Sha 煞). You might have noticed that I did not translate the character “Sha 煞” as “killing or to kill” like most people would, because in Feng Shui if the term is used to mean “to kill”, then the character 殺 would have been used. From a Feng Shui perspective, the term “Sha 煞” is used to contrast with the term “Sheng 生” as in “Sheng Qi 生氣” and “Sha Qi 煞氣”. Sheng Qi is Qi that encourages the potential for life and for growth, while Sha Qi is Qi that stops the potential for life and for growth. The Chinese often use the term “Sha Che 煞車” to describe the act of stopping a car. The character to kill 殺 and the character to stop the potential of killing 煞 are written differently and they have a subtle difference, and on top of this the term “Qi 氣” is used to contrast with “Xing 形” as in “Xing Qi 形氣”, the latter (Qi) is formless and intangible, its influence is indirect – an invisible potential to become while remain as formless, whereas the former (Xing) has a form/shape and is tangible, its action direct – a visible thing that has a physical effect. For this reason in Feng Shui we often use the term “Xing Sha” 形煞 and “Qi Sha” 氣煞 to differentiate a Sha that has form and is visible to a Sha that has no form and is not visible. So to understand the true meaning of “Feng Shui Cures” and how to use them properly, one should refer to the act of “Jie Xiong Hua Sha”; that is one should first be aware and understand what caused the harmfulness or give rise to the potential in the first place; is it physical, psychological or conceptual? Often in Feng Shui the cause is conceptual, in the sense that we used correlative thinking and connected a symbol or a number with a concept that is harmful or have a harmful potential. For example, in Flying Star Compass Feng Shui, the number 5 is correlated to the colour yellow and to the element Earth and when it is out of time, we say it is a disaster “Star” that would cause trouble for us, but this is only a conceptual conclusion, it does not mean the 5 Yellow Earth is physically harmful and also the “Star” mentioned earlier do not refer to the physical stars in the sky but to the Gua Qi 卦氣 or the Qi of the Trigrams we used in the Feng Shui methods. After “Jie Xiong 解凶” then we can “Hua Sha 化煞”, and we need to remember, a Sha can be physical, psychological or conceptual or a mixture of two or three of them, so to change it or to transform it, that is to turn the Sha Qi into Sheng Qi, we can also do it on a physical, a psychological or a conceptual level or a mixture of two or three of them, but unless we can understand the real cause of the harmfulness or the potential for harmfulness in the first place and to overcome it, the “Hau Sha” will always be incomplete and temporary. For example, when a house is located at the end of a T-Junction, we say in Feng Shui it has “Chong Sha 冲煞” or the “Sha of Being Rushing-At” and this is harmful or has the potential to harm and it is undesirable, that is it has Xiong 凶 and we need to overcomes it and make it Ji 吉 – auspicious or desirable; in another words, to turn Sha Qi into Sheng Qi. Of course the best solution would be to avoid it in the first place; that is not to have a house located at the end of a T-junction, but what if we cannot avoid this situation? Then the first thing is for us to understand why it is not desirable or it could be harmful, that is to “Jie Xiong” (understand the reasons) before we can “Hua Sha” (make the changes). When a house is located at the end of a T-junction, it is physically annoying to have car lights shinning at it at night time and then suddenly disappear after the car has trued the corner, it also has the potential of someone running into it if a driver fails to turn the corner properly. Psychologically a house located at the end of a T-junction always has less privacy, as anyone who turns the corner will tend to look into the house, because it is more exposed. So this house has “Xing Sha” (Sha of the Form) and “Qi Sha” (Sha of the Formless) at the same time. To overcome this, we can do it in a physical way and build a brick wall of about one and a half to two meters high in front of the house and physically and psychologically block the “Xing Sha” and the “Qi Sha” at the same time and that would be a best “Hua Sha” or Feng Shui Cure. But if we cannot do this, because we don’t own the house or we don’t have the fund to do it or we simply don’t like the idea, then we can do it in a psychological and/or conceptual way. Psychologically we can cover it up with trees and shrub so we will not see the Form Sha nor worry about the formless Qi Sha, but to grow the trees and shrubs to a desired height and thickness will take time, so for the short duration we can use a “Hua Sha” from the conceptual level and hang a Bagua mirror in front of the house and use the Feng Shui mirror to “reflect” the Sha Qi and turn the Sha Qi into Sheng Qi conceptually. We can do this because in Feng Shui theories we correlated the Bagua diagram to symbolize changes and the mirror is able to “reflect” what is bad into good in a metaphorically way. However, physically we have not really done anything to address the cause, so eventually we still need the physical protection to be 100% certain. So in this sense, a Hua Sha on a conceptual level, or what most people would understood to be a “Feng Shui Cure”, is like a head-ach powder, it is only effective for a short time, without getting to the cause of the problem. Ideally, a Hua Sha should work on all three physical, psychological and conceptual levels, so in the end the problem can be overcome physically, emotionally and spiritually at the same time. This is the true meaning of “Jie Xiong Hua Sha” 解凶化煞, otherwise we are open to abuse by charlatans forever trying to sell us all sorts of “Hua Sha” or Feng Shui Cures at an exorbitant price without any long term benefits, except, over time, as a piece of Feng Shui curio! If we can understand the true meaning of “Hua Sha”, then instead of buying some expensive and curiously looking objects, we can use this understanding to transform the quality of our environment at the same time. Below is a couple of photos of the new Star Hotels and Casino we did the Feng Shui for in Sydney Australia and here we used the Wuxing Shen-Ke concept (Five Elements Generating and Controlling Relationships) to advise our clients not to use “Fire” but to use “Metal” and “Water” at the water front façade to enhance the idea of wealth and money “Cui Ji” 催吉 or to hasten one’s “luck” and if Fire is used then we have to “Hua Sha”, since in the Wuxing theory Metal is correlated to wealth and money and Water is correlated to exchange or the gathering of wealth and money. However, whereas Fire will tend to ‘melt” the Metal. All this is not done physically but only in a conceptual level, if the users and the owners want wealth and money they still have to work for it! We can only “Cui Ji Bi Xiong” 催吉避凶 or “hasten the auspicious and avoid the harmful”, for those who can use their wealth or money wisely! So we can see in Feng Shui, awareness/knowledge is enlightenment, as a scholar in the Ming Dynasty Wang Shou-Ren 王守仁 has this to say about Jie Hua 解化 (“to be aware and understand and to transform” as in knowing what is harmful in Feng Shui and then change it) in the lower chapter of his book “ A Transmission of a Record of Learning”: Knowledge also needs enlightenment, but without self understanding and self transformation, but mistaken hundreds of others (ideas) as one’s own. Naturally, one’s enlightenment is limited”. 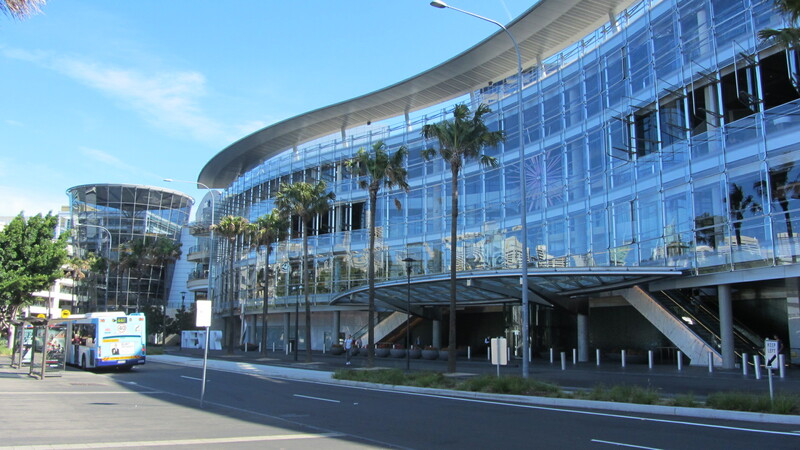 Harbour-side facade of the new Star Hotel and Casino in Sydney Australia, open in September 2011. We (ar-qi-tektur Berlin) worked as the Feng Shui consultants for this project. 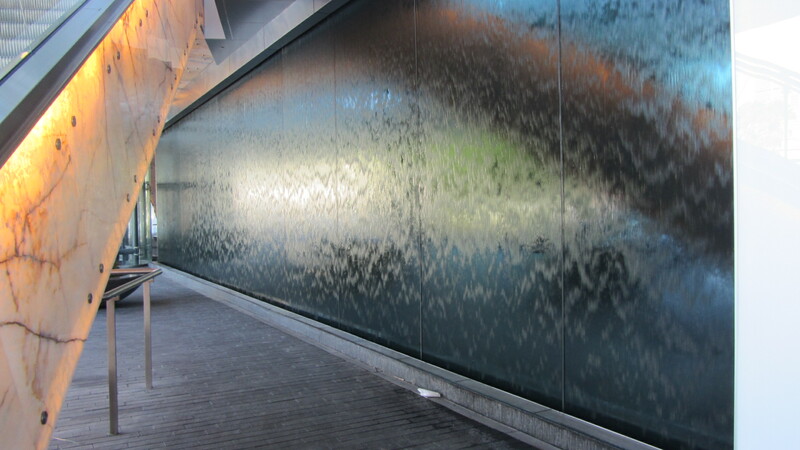 Water feature behind the lift and escalators at the waterside entrance to the casino.